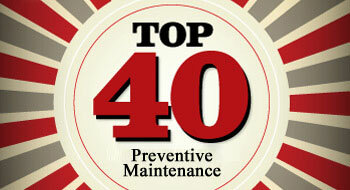 Fill out the form and get immediate access to download the Top 40 Must Do Preventive Maintenance Checklist. Use it as the foundation for creating your very own Preventive Maintenance Plan. Please Note: The Preventive Maintenance items and frequency contained in this list are general suggestions. You should still check with your local governing body for specific requirements on each task for a complete plan. Requirements may vary by region.